Published: Nov. 27, 2016 at 09:53 p.m. Updated: Nov. 28, 2016 at 06:56 p.m. Opportunity is the name of the game in fantasy football. Talent matters, of course, but we want players who see a healthy volume of targets and touches to anchor our lineups, especially in daily fantasy. Every week in the second season of the Opportunity Report, we'll look at all the passing targets for every NFL team and the percentage each player owns. Franchise will handle the backfield touches section this year and his Week 12 piece is tabbed above. It's not hard to see why the Cardinals offense has fallen off when their leading receivers are their starting running back and tight end. The 10 targets Jermaine Gresham absorbed on Sunday were the most he's seen since December 22nd, 2015 with the Bengals. It's a function of a complete lack of consistency at the availability of the players in the No. 2 receiver spot. John Brown supposedly came into this game healthy, but left early with a hamstring injury. It was just another down moment in a lost year for him. Michael Floyd also came into the game banged up. Patrick Peterson shadowed Julio Jones on 18 pass plays and limited him to just three catches on five targets for 31 yards, per Next Gen Stats. Yet, the Falcons showed off their wide array of counter-punch options in the passing game here. Mohamed Sanu went out on a team-high 88 percent of the team's offensive plays, and led the team in targets. Taylor Gabriel continues to emerge as a difference-maker as a big-play threat, as he has five total touchdowns over the last four weeks. Even better news: his snaps have taken a general trend up playing 19.4 percent, 50.8 percent, 45.2 percent and 68 percent over the last four weeks. No Ravens player saw more than 15.2 percent of the team targets, and their tight end and fullback led the way with five targets apiece. This is the definition of spread out. It was nice to see Breshad Perriman make a startling catch in the end zone for a score, but he played fewer snaps than Kamar Aiken behind Steve Smith and Mike Wallace. Steve Smith's four targets were the lowest he's seen since Week 5 when he got hurt early against Washington. This was a clear outlier in Smith's usage on the season. Sammy Watkins was only on the field for 24 total plays, but made an impact in catching all three of his targets, including a deep ball for 62 yards. He'll certainly handle more working going forward now that he passed his first test. With Watkins back, and especially with Woods out, the rest of the receivers fade to black and are no longer worth considering. LeSean McCoy was the only other player who posted more than 17 receiving yards. Kelvin Benjamin was in an out of this game with an injury, and he was frustrated on the sideline with being pulled. However, he made the most of his chances and hauled in his first touchdown since Week 4 on a long bomb. The Panthers clearly wanted to take advantage of Ted Ginn's deep speed with the Raiders playing several backup cornerbacks. Ginn took advantage of depth defensive back T.J. Carrie on his long touchdown with 2.6 yards of separation at the point of the catch. Devin Funchess once again played fewer snaps than Ginn and Corey Brown. With Alshon Jeffery suspended it was the long-forgotten pass catcher Marquess Wilson, not Cameron Meredith, who stepped into the spotlight as the team's No. 1 receiver. Wilson is a talented player who was just activated off the PUP list heading into Week 11. He's definitely going to be on fantasy radars with the Bears playing the 49ers in Week 13. Daniel Brown was the top tight end on the team, going out on 63 percent of the team's plays. With A.J. Green out it was no surprise to see Tyler Eifert lead the team with 11 targets. Brandon LaFell played on 89 percent of the team snaps and saw an identical number of targets to rookie Tyler Boyd with nine. Boyd was only targets on average 7.9 yards down the field, so he still lacks the individual upside from a usage standpoint that LaFell carries even if he has the brighter future. Boyd was named a starter in two-wide receivers sets and out-snapped James Wright. Rather quietly, the Browns are emerging as a pretty concentrated offense between Terrelle Pryor and Corey Coleman. Their wide receiver duo is the only foundation of their scoring-unit at the moment, so that certainly makes some sense. We should expect these two to handle the lion's share of the team targets from here on out. Dallas didn't take to the air much in this contest, so Dez Bryant led the way with 33.3 percent of the market share but had just seven total targets. His usage was not alarming in this game. Overall, the distribution was just about business as usual. Emmanuel Sanders became just the latest receiver to rip up the Chiefs from the left wide receiver spot. Plenty of analysts (myself included) missed that coming in, because Demaryius Thomas actually takes more snaps from the left side than Sanders on the season. However, my mistake was underrating just how much those two moved around, as neither was stationed on one side more than 50 percent of their plays this season. Lesson learned there. Marvin Jones' 11 targets were the most he's seen since Week 2, and he did a good amount of damage on the first few drives. The production didn't really follow the volume, and this offenses' distribution is extremely difficult to project with all their players healthy. Example: Eric Ebron came into this game with 241 yards in his last three games, but registered no catches on just one target on Thanksgiving. No player in Detroit has more than a 22 percent market share of the targets on the season. The momentum of the top target in the pass game has flipped from Jones at the start, Tate in the middle, then to Ebron for a few weeks and now we just aren't sure where they stand. As usual, the usage was there for DeAndre Hopkins, but it matters not with Brock Osweiler at the helm. Eventually, however, that volume will turn into more production. Look out for Week 13 against the Packers to be a possible game where it does. Will Fuller did haul in a deep ball, but went out on fewer plays (75 percent) than Braxton Miller (88 percent). T.Y. Hilton left this game with a back injury, tried to come back in the second half, but ultimately elected to take himself out once again and never returned. In his stead, Donte Moncrief led the team with 11 targets. He's scored a touchdown in every game since his Week 8 return from injury, but also has yet to cross 60 yards receiving. All four of those scores have come in the red zone, where he leads the team with five targets over the last four games. It's now been two-straight games that Marqise Lee has scored a touchdown. He's starting to get downfield targets after being mostly a short-area receiver to start the year. He's the clear No. 2 receiver at this point even though he plays fewer snaps per game than Allen Hurns. Blake Bortles has notably struggled to connect with Hurns this season. Today was his fourth game with a catch rate lower than 50 percent and he's only eclipsed that mark three times on the year. With the Broncos struggling to cover move tight ends this season, the Chiefs clearly deployed Travis Kelce to exploit that weakness. Kelce saw 12 of his 15 targets when lined up in the slot or out wide. Kelce is on pace for a career year and 119 total targets. Tyreek Hill continues to be a major force and scored a touchdown as a receiver, rusher and kick returner. Even better, Hill played on a season-high 67.9 percent of the offensive snaps. Jared Goff was much improved in Week 12 following a lackluster debut the week prior. The No. 1 overall pick was 4-of-9 for 80 yards and two scores when throwing passes that traveled farther than 10 yards after going 0-for-5 in Week 11. Goff's ascent to the starting role has not dampened the shine on Kenny Britt's rebound season, either. He leads the team with 28 percent of the team's targets in Goff's two games. Lance Kendricks appears to be his second favorite target, trailing only Britt with 14 targets. Jarvis Landry's streak of seeing fewer than 10 targets continued this week. DeVante Parker was making circus catches and near-receptions all game until he went down with a back injury. These two receivers complement each other and the running game well, but they also do dig into each other's production a good bit. With Stefon Diggs out for this game, Adam Thielen once again stepped into a big role, leading the team in wide receiver snaps and targets. Thielen is legitimately playing well and is probably a part of the reason first-round rookie Laquon Treadwell can't get on the field. Kyle Rudolph has target totals of three, eight, three and 10 since Pat Shurmur took over as offensive cooridnator. It's much harder to predict his volume now than it was when he was averaging 7.7 per game with Norv Turner manning the show. Chris Hogan went out on 92 percent of the Patriots offensive plays after missing last week with an injury. Despite that, Malcolm Mitchell still caught two touchdowns on seven targets despite playing on 46 percent of the plays. Both Mitchell and Hogan provide more of a downfield element than Julian Edelman. Mitchell does have more individual upside as a talent than Hogan, and we're already starting to see a glimpse of that future here. For this year, however, it's important to remember he's benefited from circumstances the last two weeks. Hogan's Week 11 absence pushed him to a 98-yard effort and he hauled in both of his scores this week in the red zone. That likely does not happen if Rob Gronkowski does not leave the game early. Michael Thomas' 10 targets were the most he's seen since Week 7, and this marked a "bounce back" for him after a slow two week stretch where he totaled 108 yards combined against Denver and Carolina. 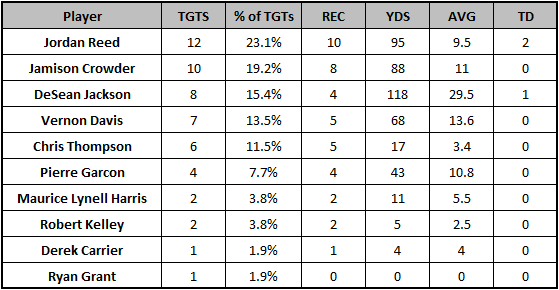 Thomas leads New Orleans in just about every relevant receiving category at this point. Brandin Cooks disappeared on Sunday and did not see a single target go his way. He was not shadowed by one particular corner on the Rams, he just disappeared. File this in the "it happens" folder. New Orleans does appear to be rotating their personnel packages more as the season progresses. Thomas led the wide receivers in snap share and played just 68 percent. The only pass-catcher who was out on the field on a regular basis was tight end Josh Hill, who went out on 79 percent of the team's plays. The Giants didn't need much from their other pass catchers outside of Odell Beckham, who handled over 40 percent of the team targets. Sterling Shepard was fantastic in Week 11 with a 42.2 percent share of the team's intended air yards in that game, but didn't gather a single target on Sunday. With Ryan Fitzpatrick staying on as the starter, the pass-catchers will remain in focus. Brandon Marshall found the end zone for the first time since Week 5, which was also his last 100-yard game. With the volume he gets, he's a threat for that every week. Yet, we know it's been a slog to chase those more often than not. After registering just one catch in each of his last two weeks, Quincy Enunwa erupted for 100-plus yards and a touchdown. There has not been a more difficult receiver to predict in the NFL this year. The Raiders threw nine passes in the red zone on Sunday. Amari Cooper came down with one of them for three yards, but it was once again Seth Roberts who brought down the score on a two-yard catch. Michael Crabtree was the most-targeted player, and moved all around the formation with 24 plays at right wide, 10 at right slot, eight at left slot and 15 at left wide. He caught at least one pass at all positions. This was the second touchdown of the season for Clive Walford, his first since Week 2. He has not seen more than four targets since that Week 2 loss to the Falcons, so don't go chasing that. Ben Roethlisberger only threw 20 passes in this game, as it was really never in doubt. Antonio Brown was a dominant force on Thanksgiving, and by far led the team in all relevant receiving categories. The wide receiver playing time split saw Cobi Hamilton go out on 54 percent of the plays, Eli Rogers 48 percent and Sammie Coates 20 percent. It's hard to tell what to take out of that, as this game was not competitive, but it sure looks like a rotation is developing. One spot where a rotation has yet to develop is at tight end. Ladarius Green played just 14 snaps in Week 12. After the game Mike Tomlin said "There's one thing to be healthy. There's another to be football ready." The head coach did say he is starting to see some of those signs from Green and that he hopes it continues. Tyrell Williams got No. 1 receiver usage in this contest. Perhaps that should not surprise us with the way he's performed this season when not facing the Broncos. Read: this should not surprise us. As long as Williams' shoulder injury that forced him out of this game early is not serious, he will absolutely dominate down the stretch. Should he miss time, it will boost Travis Benjamin, who has not had the same impact since returning early from a PCL injury. Colin Kaepernick is spreading the ball around to all of his pass-catchers and does not appear to have a discernable favorite receiver. Quinton Patton, who left this game with an injury, leads the team with just a 17 percent share of the team targets since Colin Kaepernick took over in Week 6. Kaepernick has paid off as a fantasy starter on his own in Chip Kelly's offense, but predicting the volume distribution among his receivers is even less clear than it was under Blaine Gabbert. Tyler Lockett played on a season-high 84 percent of the team's offensive plays, and finally passed Jermaine Kearse. Those newfound chances led to quite a bit of nothing, though much of that had to do with Russell Wilson being off on the day. According to Next Gen Stats, Lockett ranked fourth on the week in average yards of separation at target with 3.9 yards and Doug Baldwin ranked second with 4.3. Wilson simply wasn't himself. Mike Evans collected 65 of his yards and one of his touchdowns when covered by Richard Sherman on Sunday. The third-year wideout already has his third-straight 1,000-yard season and is playing at an All-Pro level this year. In his second game back from injury Russell Shepard out-snapped Cecil Shorts and garnered three targets. Cameron Brate continues to hover over 60 percent, but under 70 percent of the team's offensive plays run. However, he did have a touchdown called back in this game. He's still a major part of this offense, but doesn't have much of a safe floor if he does not find the end zone. Rishard Matthews now has seven touchdowns over the last eight weeks. He's clearly established as the No. 1 receiver in Tennessee, playing on 87 percent of the offensive plays. There wasn't much to go around for the rest of the wide receivers. Tajae Sharpe played on just 67 percent of the plays, which is down from recent weeks. Even more alarming, Kendall Wright was out on just 29 percent of plays. He's a part-time player only, and his playing time varies greatly from week-to-week. Despite suffering a serious shoulder in this game, Jordan Reed still completely balled out in the second half. Nevertheless, Reed may miss some time in the next few weeks. Vernon Davis racked up 129 yards and a touchdown in the two games Reed missed earlier, and remained involved even after he returned. He would be a direct beneficiary if Reed were to sit out any games. Jamison Crowder is officially in the every-week circle of trust consideration. Even with everyone out there Crowder led the team in wide receiver snap share with 79 percent.